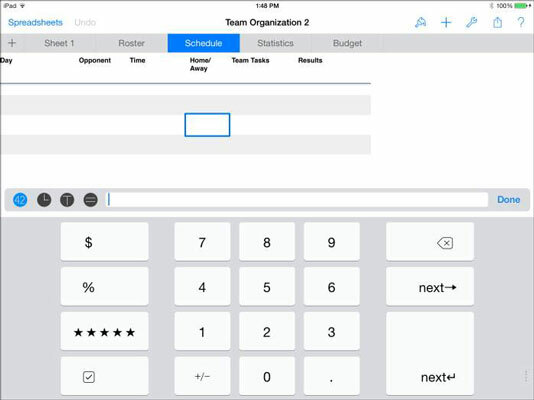 The numeric keyboard in the iPad Numbers app (accessed by tapping the 42 button) has a typical numeric keypad along with four large buttons on the left (see the figure). Currency: This option adds the appropriate currency symbol, such as $ or €. Percentage: The percent symbol follows the value. Stars (rating): This option lets you display a number from 1 to 45 as a star rating. Numbers greater than 5 display with five stars. To change the number of stars, type a new number or tap the star display in the cell or in the display above the keyboard. You can use stars in a spreadsheet and then sort the column of stars so that the ratings are ordered from highest to lowest, or vice versa. Check box: A check box is either selected or not. Check boxes are selected and deselected by a user or as the result of a calculation.